- Propolis is a mixture of gum and resin prepared by bees for making and repairs hive as well as medicines for sick bees. - Having remarkable healing properties, its extract has been used as natural antiseptic since ancient times. Its properties are well known for alternative medical practitioner in modern days. - It has the values of anti-bacterial, antivirus and anti fungi, anti-inflammatory. 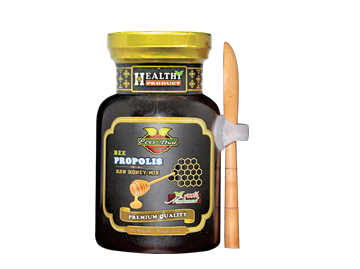 Eco Thai Bee Propolis was extracted from stingless bee hives in our farm and mixed it with Raw Honey. Only 2 ingredients used – no additives or preservatives added.